Aerospace giant Lockheed Martin announced it is building a prototype of a robotic deep-space outpost for NASA. The company is transforming a 15-year-old shuttle-era container used to haul cargo to the International Space Station into a prototype of a habitat where astronauts would live during long missions. It’s a step toward what NASA calls the Deep Space Gateway, an outpost orbiting the moon. NASA wants to have it up and running by the mid-2020s. The goal is to provide a stepping-stone for a push into the solar system and, eventually, Mars. The Deep Space Gateway will be uninhabited for months at a time, so it will have to have robotic capabilities to operate autonomously. 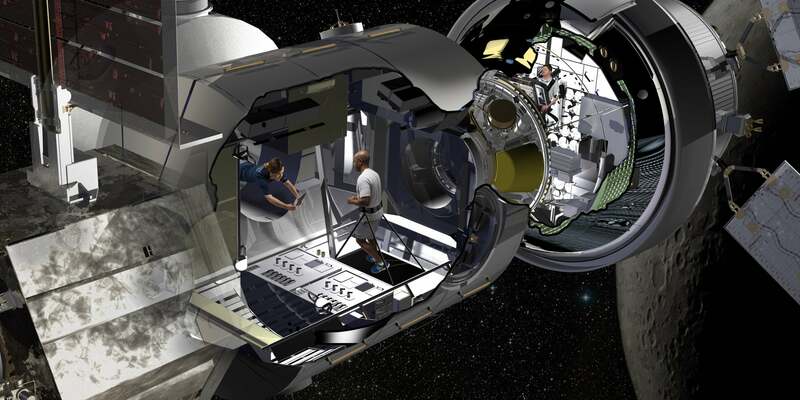 The interior of the massive aluminum cylinder will be turned into living quarters with work stations, exercise and storage spaces for food, water, and supplies — “all the things you need to live and be happy in space,” Lockheed Martin program manager Bill Pratt said in a press release. We talked to Jim Bell, an astronomer, planetary scientist, professor in the School of Earth and Space Exploration at Arizona State University, and veteran of nine NASA missions, about some of the problems that have to be cracked before humans live in deep space. Bell cautioned that the space agency is blue-skying the concept. He pointed out it’s an extension of the space station. Question: Artificial gravity is a problem that has to be cracked. What are some of the other obstacles in living in deep space? Take a phone call, for example. You say “Hello,” then it takes twice that delay, anywhere from about eight to 40 minutes later to hear “Hello” back. That gap is called latency. Latency applies to voice calls, email, any kind of communication that travels at the speed of light. Q: What are other obstacles in living in deep space? In low Earth orbit, where the International Space Station resides, it’s protected from the worst radiation by the Earth’s magnetic field. The station’s hull blocks most of the radiation impinging on it. Obviously supplies will be an issue. LunaH-Map, ASU’s first exclusive NASA deep-space mission, will investigate precisely that. When it launches in 2019, the tiny spacecraft will fly to the moon and hunt for ice. Bell is mission deputy principal investigator. Bell pointed out that people have to reinvent how to go to deep space. It has been 40 years since the Apollo missions. If the Earth was a basketball and you laid a dime on top of it, that dime is as far into space as we go right now. Top image: Lockheed Martin artist rendering of the NextSTEP habitat docked with Orion in cislunar orbit as part of a concept for the Deep Space Gateway.